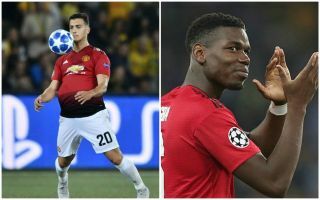 Manchester United midfielder and captain for the evening Paul Pogba has explained how Diogo Dalot impressed the entire squad on his debut against Young Boys. The youngster made his first appearance for the Red Devils since joining the club in the summer and made a real impression in an important win for the team away from home in the Champions League. Speaking after the game, Pogba gave Dalot a glowing review and suggested the rest of the squad were also pleased with what they saw from the 19-year-old and proud of his performance. ‘For a debut he did really well,’ Pogba is quoted in the Metro. United have a proud record of bringing through top young talent, and Dalot could yet have an important role to play in this squad this season. Antonio Valencia is currently first choice at right-back for United, but is ageing and started out his career in midfield, meaning he’s far from an ideal candidate to continue there. Fans will be glad to hear Pogba and others rate Dalot so highly and that he’s made such a strong start to his Old Trafford career.